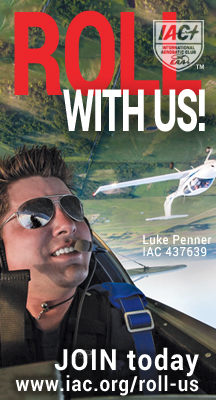 The nomination deadline for outstanding IAC volunteers to be recognized for their contribution to the sport of aerobatics has been extended to July 15, 2013. “Power” added to Unlimited and Advanced Teams to differentiate from Glider. This year's IAC election packet, mailed in early June, asks for your vote to adopt improvements to IAC's governance proposed by the board. You may vote in person at IAC's annual meeting at Oshkosh, or by returning the proxy card enclosed in the election packet. Find more information here [login required]. Carl Bury, IAC 1625, former president of the International Aerobatics Club, passed away on May 31 in Savannah, Georgia. He was 81. Carl was IAC’s third president, succeeding Verne Jobst in 1978 and serving until 1981. One of the founding members of IAC Chapter 34 in Ohio, he was instrumental in organizing the chapter’s early competitions. After his leadership capabilities and business talents came to the IAC leadership’s attention, he became more involved at the national and international level and was vice president before taking over as head of the organization. OpenAero Version 1.3.2 can now be set to print forms A, B, and C! OpenAero (www.openaero.net) Version 1.3.2 can now be set to print forms A, B, and C acceptable for use at IAC contests. Remember that all submitted Free programs must be checked, signed and dated by a current IAC Judge per IAC Rule 6.14, and that the competitor has final responsibility for the legality and legibility of the forms. IAC does not specifically test, approve, or endorse any sequence design or drawing software.